The interaction of lithium acylates α-carbanions (obtained via metallation of acetic, butyric, and isobutyric acids with lithium diisopropylamide) with 1,2-diiodoethane under argon in tetrahydrofuran at 20–25°C has proceeded as oxidative cross-coupling of enolate anions to form succinic, 2,3-diethylsuccinic, and 2,2,3,3-tetramethylsuccinic acids with yields 50, 53, and 16%, respectively. 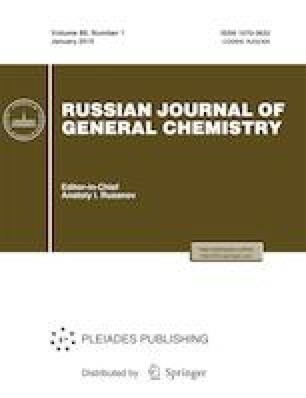 The products of sequential nucleophilic substitution of iodine atoms with alkyloxycarbonyl species have not been detected. Russian Text © A.V. Zorin, A.R. Chanysheva, A.O. Lenkova, V.V. Zorin, 2019, published in Zhurnal Obshchei Khimii, 2019, Vol. 89, No. 1, pp. 136–139.